If you are dealing with the error code 0xc0000005 on Windows, you can check out the methods mentioned in this article in order to fix that error code. Well basically, you can get the error 0xc0000005 under three kinds of circumstances. One is ‘Access Violation Error’, then the next would be ‘The application unable to start’ and the last would be ‘Windows Installation Error’. This type of situation occurs when the program you try to run is attempting to reach a location that is not assigned to it. You can try the methods below to troubleshoot this error. Method #1: First, you should run your security software to scan out malicious programs. Method #3: Sometimes the error appears due to corrupted Registry. You can restore your Registry or check all your Registry entries and remove any redundant one. Note that it is strongly recommended to back up your registry before you proceed as any improper manipulation can bring unexpected consequences to your Registry. Method #4: In addition to all the causes above, an incompatible RAM can also result in Access violation error. In this case, you should completely cut off the power of your computer, and then remove the RAM(s) from your computer or replace them with other RAMs. #2. The Application Unable to Start! To resolve this error, you can try the methods below. 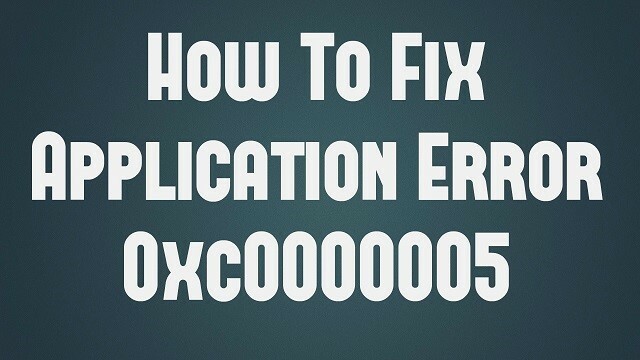 Method #1: It is also possible that the application unable to start error is caused by viruses or malware, you should run a full scan of your computer to identify the origin of your problem. Or in some cases, the security software itself can cause the issue. You can try disabling it to see if the problem is removed. Method #2: Well, you may also get this error because your BCD (Boot Configuration Data) file is corrupted. You can try repairing it and see if you can fix this error. Important: You need a Windows installation media for your system before you begin. And you may need to re-activate your Windows after you follow the steps below. Close the Command Prompt window and restart your computer. Then check to see if you get rid of the error. You can also get 0xc0000005 error when you are installing your Windows. The error message tells you that Windows installation encountered an unexpected error. At this point, you cannot continue your installation. Well, the reason for this error can be that the operating system you are installing is not compatible with the partition. You need to delete all partitions and create new ones. So taking backups before proceeding is a wise idea!